This is arguably the best explanation of the value of free market capitalism EVER. Pretty much everything everyone does is driven by self-interest and this notion that political self-interest is somehow more noble than economic self-interest has never proven to be true throughout all of human history. President Trump struck a trade deal Wednesday with the European Union, reaping significant concessions as top EU officials moved to avoid an escalating tariff war with the U.S. The agreement seeks to eliminate all tariffs and trade barriers and eliminate all subsidies on non-auto industrial goods, which was the deal pushed by Mr. Trump. 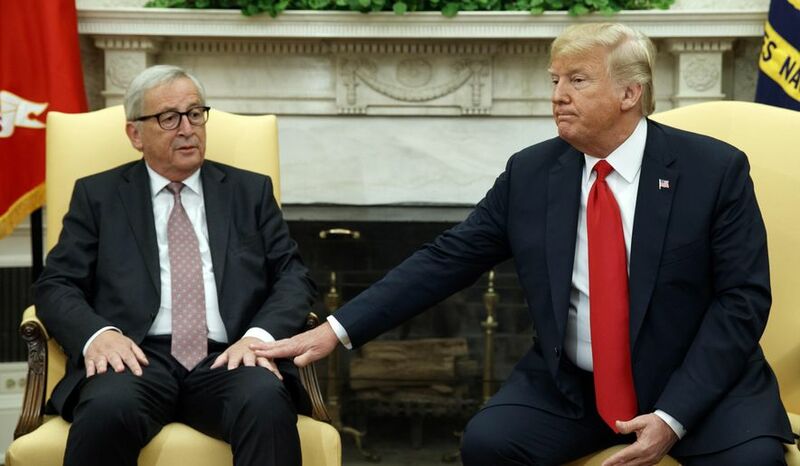 “This was a very big day for free and fair trade,” Mr. Trump said in announcing the deal in the Rose Garden with European Commission President Jean-Claude Juncker by his side. Mr. Trump called the deal a “new phase” in the U.S.-E.U. relationship. The deal also included the E.U. importing more U.S. soybeans, lowering industrial tariffs and working on an agreement to import more liquified natural gas (LNG) from America. “I had the intention to make a deal today and we made a deal today,” said Mr. Juncker. Taxes are no longer necessary. This video exposes a deliberate and massive accounting shell game/swindle that is perpetrated by every government agency from your local school district all the way up to the Federal government. This is the second Version of this expose' on public finance. Similar to first version, but incorporating input from Walter Burien and Clint Richardson. Is there a gender wage gap? Are women paid less than men to do the same work? Christina Hoff Sommers, Resident Scholar at the American Enterprise Institute, explains the data. tofirst version, but incorporating input from Walter Burien and Clint Richardson. "The Biggest Shell Game In Town"
This video was producedonJanuary8th 2000 and then was distributed only by VHS tapes. About 8,000 originals were distributed internationally and copy/distribution rights were given whereby about 140,000 1st, 2nd, and 3rd generation copies were circulated. The documentary published to Google video is not the best film quality but it gets the valid information out there and was annotated on the lower script line with 2008 information. This was the first CAFR1 video that got the ball rolling for international disclosure of the CAFR of which has become the biggest shell game played in government finance. My talk with Catherine Austin Fitts former assistant secretary of housing under George Bush Senior. Catherine talks about her own breakaway from the psychopathic, corrupted Government money system, and her wonderful work now at www.solari.com where she is helping people to understand our system, and move towards a more symbiotic one, based on empathy, morals, truth and co operation. Here in the richest country on earth, 50 million of us — one in six Americans — go hungry. More than a third of them are children. Debates on how to address hunger – in both Congress and the media — are filled with tired clichés about freeloaders undeserving of government help, living large at the expense of honest, hardworking taxpayers. But the documentary A Place at the Table paints a truer picture of America’s poor.